Poetry and food? Absolutely with Huevos Rancheros. First of all I love Tejano music, Norteño music. It’s just in my blood. Whether I’m driving or at my desk, when I hear a conjunto, a corrido, una polka, I instinctively want to stand up and twist, or swing my hips, shuffle my feet, or sing or shout un grito. Second, I always connect my dishes to music or poetry, and Norteño music is somehow embedded in most of my recipes. I’ve got lots of company when it comes to huevos rancheros, a dish that has inspired punk poetry from Anthony The Poet (Anthony M. Flores) and mentions in Chicanx detective stories, novels and poems. So, when you make these Huevos Rancheros, you’ll be connecting to many Tejano, Norteño poets and singers who’ve performed in praise of huevos rancheros. You can make this traditional breakfast recipe even if you’re bleary-eyed. Just make sure you’ve got pinto beans in the fridge. You can make the salsa in a blender, then set aside. Then it’s just a matter of cooking the potatoes and eggs. It’s a snap to assemble this attractive, iconic dish. I think you’ll want to make huevos rancheros, especially after hearing Joan Sebastian. Huevos Ranchers made with freshest ingredients, little fat. 1. Peel and cut the potatoes into small wedges. 2. In a saucepan, bring the water to a boil and then add the potatoes, cook at a simmer for 7–9 minutes or until the potato wedges have softened but are still a little resistant when pierced with a toothpick or fork. They will cook completely during the next step. 3. Drain the potatoes, and then add them to a skillet where you have heated 1 tablespoon canola oil over medium heat. Let them cook for 3–5 minutes to allow them to get a little crispy and develop a golden color. Set aside. 4. Heat the salsa ranchera in a small pan and set aside. 5. In a nonstick skillet, heat 1 tablespoon canola oil over medium heat. Gently add the two eggs and cook slowly. If you like them sunny side up, just let them cook a bit. But I like them cooked more, sowhen the white is cooked, flip the eggs over using a rubber spatula. With practice you will not need a spatula; you will just flip them in the pan. Cook the eggs as you like them. 6. Place the eggs on a plate, along with the potatoes and the hot beans. 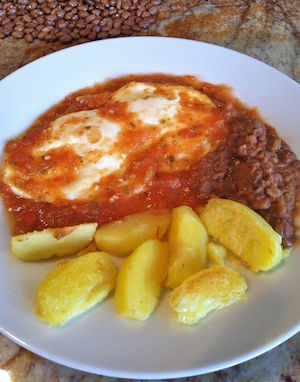 Pour the hot salsa ranchera over the eggs. Serve immediately with corn or wheat tortillas. Saucy and tasty huevos rancheros!